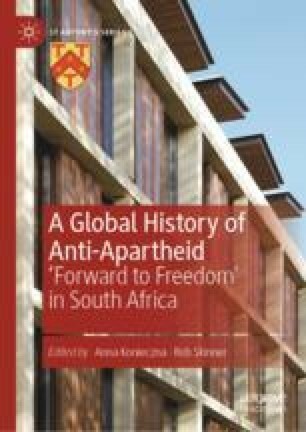 This chapter analyses the relationship between the United Nations and the global mobilisation against apartheid. It suggests that we should move the perspective from the power hierarchies to democratic process of the organisation. Only this perspective will allow us to re-asses the role of the organisation in bringing apartheid to the end. The General Assembly rather than Security Council should be the main focus in this regard. Through the activity of the UN Special Committee Against Apartheid, an action-orientated body, who progressively expanded the scope of its responsibilities, the organisation was pivotal to the emergence of the international campaign against apartheid. From the late 1960s, it launched an information campaign on apartheid, then brought about the coordination of anti-apartheid networks before developing its own worldwide campaigns. At the same time, anti-apartheid organisations proved to be influential in the fulfilment of the aims of the UN itself. On the one hand, they translated norms into specific actions and discourse. On the other, they acted as channels through which the UN could disseminate information about apartheid, monitor the activity of member states with regard to apartheid before becoming an important element in the enforcement mechanisms. The relationship between the organisation and the non-state actors was complex and negotiated. Commonwealth Oral Histories Project. https://commonwealthoralhistories.org. Official Document System of the United Nations. https://documents-dds-ny.un.org. Struggles for Freedom. Aluka Digital Library. https://about.jstor.org/whats-in-jstor/primary-sources/struggles-freedom-southern-africa/. United Nations: General Assembly Resolutions. http://www.un.org/en/sections/documents/general-assembly-resolutions/. United Nations Treaty Collection. https://treaties.un.org. South African history online. Oliver Tambo to E.S. Reddy: Extracts from letters, 1964–1969. Accessed August 1, 2018. https://www.sahistory.org.za/archive/oliver-tambo-es-reddy-extracts-letters-1964-1969. Blog of Hugh Crosfield, ‘Critical Geographies of Anti-slavery Food Activism in a Global Age.’ “A Visual Introduction to Boycott Outspan Action and the Blood-Citrus Topos.” Accessed August 15, 2018. https://hughcrosfield.wordpress.com. Social History. Essau Plessis. “The Story of Outspan Oranges in the Netherlands (NL) and the Campaign of the Boycott Outspan Action (Boa). Accessed August 15, 2018. https://socialhistory.org/sites/default/files/docs/collections/outspan-boa-esau.pdf. South African History Online. Enuga S. Reddy. “Sports and the Liberation Struggle: A Tribute to Sam Ramsamy and Others Who Fought Apartheid Sport.” Accessed August 1, 2018. https://www.sahistory.org.za/archive/oliver-tambo-es-reddy-extracts-letters-1964-1969. Struggles for Freedom. Aluka Digital Library. Enuga S. Reddy. Letters to Oliver Tambo. Accessed August 1, 2018. http://www.aluka.org/action/showMetadata?doi=10.5555/AL.SFF.DOCUMENT.ESRSAP1B40002. Struggles for Freedom. Aluka Digital Library. Enuga S. Reddy. Reminiscences of Oliver Tambo. Accessed August 1, 2018. http://www.aluka.org/action/showMetadata?doi=10.5555/AL.SFF.DOCUMENT.ESRSAP1B40001. Warson, Joanna. “Entangled Ends of Empire: The Role of France and Francophone Africa in the Decolonisation of Rhodesia.” Journal of Colonialism and Colonial History 16, no. 1 (2015). https://muse.jhu.edu/article/577743.